Mrs. Hurt will be leaving her little dingbats. She taught us that atoms could not be trusted, and also how to light a school on fire, but after many years of service our favorite chemistry (sorry Mr. Roy) will be turning in the reigns and becoming a part time teacher. At school, she acts like a mother to all of her students and even to students who are not her students. However, she will be spending more time with her husband and kids, and focusing more on helping her aging parents and disabled brother. Mrs. Hurt is helping in the process to choose her successor by giving up class time to allow them the chance to see if they will fill in the large shoes that she is leaving. So far, it is not certain who will it will be. She will still be here, but she will still be missed. On the evening of Wednesday, Feb. 18, students of St. Christopher’s and St. Catherine’s sat anxiously by their phones and computers waiting for the administration to decide on whether or not to open school on time (if at all) the next day. One sophomore tweeted “#STCLogic Slight sleet/rain, 36 degrees: School Closed. 6 inches of snow, black ice on roads, -6 degrees: Open on time,” while a senior tweeted “time to readjust my sleep schedule...orrrr maybe I’ll just sleep through classes tomorrow. yeah that’s a better idea #silentprotest”. Regardless of one’s stance on whether or not the roads were safe to drive on, the central controversy that has arisen is whether this sort of student response is effective in changing the way decisions are made by the administration, and furthermore, whether or not it is frowned upon. Free speech is a right granted to all citizens of the United States, so how does it apply to this situation? Should students be allowed to publicly voice their opinions of administrative decisions, negative or otherwise? Editor's Note: Below is the petition to cancel school on thursday written by David Ballowe '15. It was submitted to Change.org and garnered some 440+ signatures and many passionate responses. You can view the original petition using this link. We the Students of St. Christopher's High School, in Order to form a more perfect Union, establish Justice, insure domestic Tranquility, provide for the common defense, promote the general Welfare, and secure the Blessings of Liberty to ourselves and our Posterity, do ordain and establish this Petition to Cancel School. Four Score and Seven years ago plus four score and almost seven years, we were ravaged by one of the worst snow storms in the history of Richmond, Virginia that coated the entire city in blankets of oppressive white snow. This caused great emotional distress throughout the various Richmond communities, including our very own, inclusive community of St. Christopher's School. 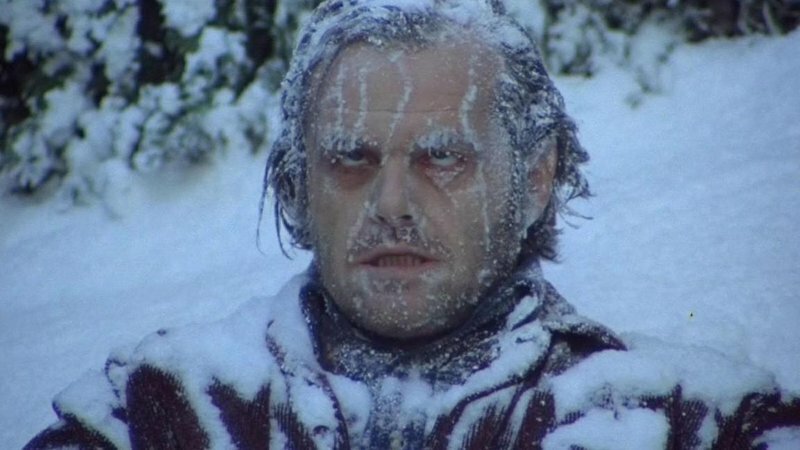 On top of the emotional toll and the physical taxation of plowing our own driveways and lawns, we now are facing the great toils of sub-zero temperatures. I speak on behalf of the people of STC when I say that I don't want to end up frozen to my desk in AP Stats. Following a very productive string of days off, where one spent his or her days studying by the fire with a warm cup of hot cocoa, a harsh toss back in to the reality of eternal damnation that is school will prove unfathomably difficult. At the very least, allow the students time to gather their emotions for two measly hours in the morning, if it is even possible to do so in such a short span of time. We appreciate your consideration, and hope that you have reevaluated your decision to the fullest of your abilities. P.S. a quote from an emotionally tormented Senior... "We can't all be scholars, but we can all crash on the way to campus"
Below is an article entitled "The Winter of Our Content" by Jack Holdaway that originally appeared in the February '14 edition of the print Pine Needle. It takes a look at the school's decision process school cancelations due to snow. As the snow begins to fall, families gather around the television. Reports of school closings come in droves and are displayed at the bottom of the screen. Speculation begins to rise as to whether school will be canceled or if we will receive the anti-climatic two-hour delay. Many refresh the school website constantly to see if a notification has been posted, as others keep an eye on the school twitter page’s activity. While we all wait anxiously for the final decision, what is going on behind the scenes? The responsibility of making the call rests solely on Headmaster Charley Stillwell’s shoulders. However, it is one he does not look forward to. “I will say that, while we all dream of having the power to call a snow day when we are students, the reality is that this responsibility is no fun at all,” he said. Mr. Stillwell takes several steps to assure that he makes the correct decision. He believes that school should be closed when snow or ice is detrimental to road conditions and traveling to our campus is unsafe. In addition, school is closed when campus cannot be sufficiently cleared. When the possibility of a winter storm is first broadcast on local news, Mr. Stillwell begins to follow the weather report. When the threat grows, he contacts faculty at Collegiate School and St. Catherine’s along with the division heads here at St. Christopher’s to get wind of their opinions. After the storm has hit, the road conditions must be assessed. That also usually falls under the responsibilities of Mr. Stillwell. “The unfortunate part of being in charge is that I am often up at 4 or 4:30 a.m. driving around on the local roads to check on conditions,” he said. In addition, the school receives information from families at St. Christopher’s, St. Catherine’s and Collegiate about the conditions across the greater Richmond area. With all of that, Mr. Stillwell believes he can accurately make his verdict. However, no one is perfect; sometimes the decision may be controversial when parents feel uneasy about driving on the roads. Nonetheless, Stillwell credits the parents for their diligence. Over the past few decades, the administration has become more lenient in closing school for weather. School used to never close for snow. “If you couldn’t drive, you walked,” said Upper School chaplain Melissa Hollerith. Rev. Hollerith recalled an instance when Mr. Boyd couldn’t pull out of his driveway because of ice, so he walked. The math teacher made the trek from his home near the University of Richmond to St. Chris only to find out that school was canceled. Rev. Hollerith believes the schools’ new found mentality towards closing school runs parallel with their desire to enroll students from all over the area. The student body has stretched across 25 zip codes, and decisions can no longer be made an hour before school starts. They need to be made the night before. “What the school has done is to try to make the decision the night before so working families can plan accordingly,” said Hollerith. Snow days have certainly had an effect on school this winter, as the past month has been littered with days off due to weather. St. Christopher’s has been closed five times; January 21, 22 and 29 and February 13 and 14 with a few other days requiring delays. It seems every week has been effected by the elements. With more snow possible, Mr. Stillwell will be plenty busy. At this point, days off are losing some of their luster, but students certainly will continue to welcome them with open arms. 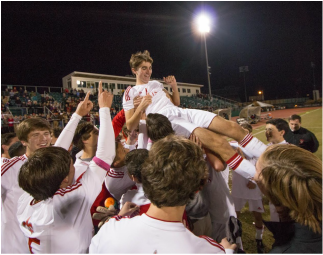 St. Christopher's wins the soccer state finals. Logan Ende '15 recaps the game in the video above. For those of us who were here in fifth grade, you probably remember biking around campus with Coach Foster at some point in P.E. Well, now with the help of Coach Foster and a few St. Christopher’s students, older students can do even more with St. Christopher’s new mountain biking team. Members of the team such as Edward Anderson have been mountain biking since Middle School and were very happy with the creation of the school’s team. Edward and fellow team member, Josh Craig, came up with the idea of a school team after contracting out fall of 2013 for mountain biking. The two approached Athletic Director John Gordon and started “breaking the ice,” as Edward Anderson put it, for the team creation. The team competed in four events in the NICA Virginia High School League (http://www.virginiamtb.org/). The team also made it to the podium (top three finishers) eight times during these four races. Open to all STC students, the biking team hopes that with the increasing popularity in mountain biking in Richmond that more people will be inclined to come out and join the team next fall. Mr. Rusty Wilson Directs "Sight Unseen"
Our very own Rusty Wilson is directing the play “Sight Unseen” at the Virginia Repertory Theater. The play is by Donald Margulies and is centered around the character Jonathan Waxman, a critically acclaimed Brooklyn artist who is married with a baby on the way. He travels to England where he encounters his former lover Patricia, who is now married to another man. The play unfolds in a non-linear form with forward and backward flashbacks covering Jonathan and Patricia’s relationship, which ended on an unsatisfactory note. The play is only running for three weeks, so make sure to come out! Where: Virginia Rep's Theatre Gym, 114 W. Broad St.
Editor's Note: This story has been temporarily taken down due to factual discrepancies. On this page you can view reports on recent events and things happening around campus.